Does the law get involved when families expose their children to radical or racist politics and religion? Being a parent is perhaps one of the most difficult jobs on the planet. Much to the dismay of every young Mum and Dad, there is no operating manual when it comes to raising a child. Because of this, parental choices usually come down to personal preference. 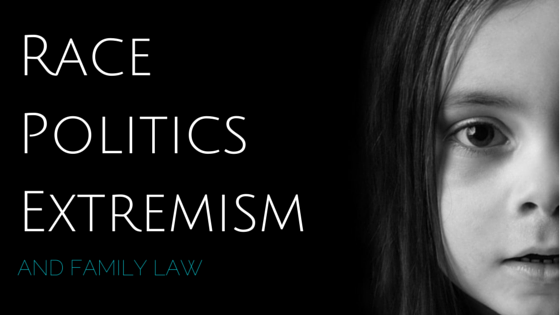 This approach usually works out fine concerning everyday activities such as diet or entertainment but when a child is exposed to extreme religious or radical politics, family law must sometimes get involved. An example of this scenario involved a mother being banned from showing her child pro-fascist websites. A judge ruled that at no point could she view this type of content when the child was present because it may result in the child feeling left out from their school peers and make it hard for them live in society as we recognise it. It should also be noted that the judge acknowledged how complicated an issue like this is. It was stressed that every parent is entitled to their own views but when a child is going through such an impressionable age, it is vital they are given a variety of perspectives so as to develop individual judgments and beliefs. Perhaps the most important point taken from this case was the reminder that in order for a child to live happily in any diverse community (like Australia is) they shouldn’t have resentment or hatred toward any culture of ethnicity forcibly imposed upon them. The subject of religion has also been viewed by family law to be harmful or against the best interests of a child. An example of this treatment was a case involving the infamous Brethren sect and a Father who had withdrawn from the exclusive religion. It is well known that when a Brethren member leaves, the remaining family members are encouraged to never see or socialise with this person again. Taking the case to court, the Mother’s defence was that her children shouldn’t spend time with their Father because it would be against their religious and communities beliefs. Interestingly, the court disagreed and ruled that the children were to also spend time with their father but both parents were restrained from insulting their opposite’s religious beliefs in the presence of children. Sadly, both parties were unable to follow the court orders and the mother was placed on a good behavior bond. From looking at these two examples, it’s important to remember that parents are not invulnerable to the law when it comes to raising their own children. If a child is exposed to extreme religious or political content, it may lead to the questioning of parental responsibility for the child/children in question. If any of these situations above sound similar or you want to know more, speak to us, we may be able to help!